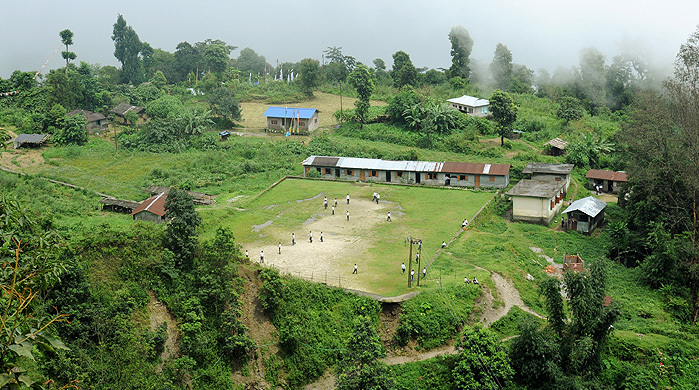 Jhandi is a newly found offbeat destination in the Dooars region of North Bengal. It is a picturesque valley and blessed with the tranquil ambiance of Himalaya. The valley offers a panoramic view of the Mahananda River valley and mighty Mt. Kanchenjunga. The valley, surrounded by lush, tropical evergreen trees, Sal and Pine forests, is the ideal location for the tourists, who love to spend few days in the serene landscape of Himalaya out from the clumpiness of the city. How to go to Jhandi? Jhandi is 9 km from Lava towards the Gorubathan and Kalimpong is only two hours journey from this place. If you want to avoid the crowd of Kalimpong, you can stay at Jhandi instead of Kalimpong. If you are planning for Lava- Rishop (a famous hill stations of North Bengal) tour, you can also choose Jhandi instead of Lava. Nearest Railway station – New Mal junction. It takes 2 hours to reach Jhandi from Siliguri if you come from New Jalpaiguri Rail Station or Bagdogra Airport. From New Mal Junction, you can hire a cab for Jhandi, which takes one hour only. Jhandi is famous for the Jhandi Eco Huts homestay. 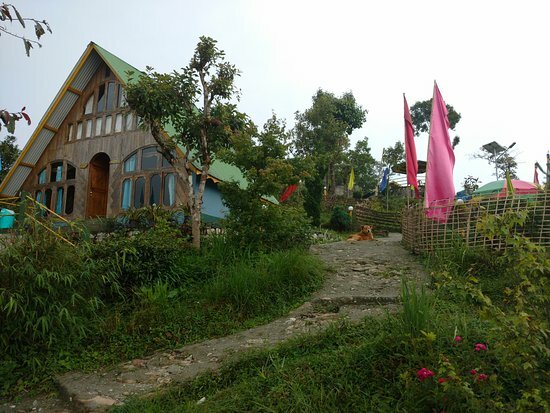 This homestay offers the best view of Mt Kanchenjunga and Mahananda river valley. These are the wooden cottages, surrounded by the garden and pine forest. This ambiance makes you feel like a Himalayan village-stay. But, don’t expect much from a homestay in an offbeat location. They offer the basic amenities with awesome foods. The cab facility for pick-up and drop is also available. Jhandi is blessed with a breathtaking view of sunrise and sunset over Mount Kanchenjunga. The Sunrise and Sunset Point, known as Jhandi Dara is the star attractions of this place. The sight of the sunlight slowly making it’s way over the mountains, and filtering through the mist, definitely is a moment worth capturing. The soft chirping and whistling of the birds in the surrounding forest create a magnificent ambiance in this valley. Tourists from the surrounding tourist spot also often come to experience this breathtaking view the beginning and end of the day. I didn’t stay at Jhandi. But, while going towards the Kalimpong from Dooars, we just bypassed it. That time, I was only 15 or 16 years old and came to travel North Bengal with my parents. Jhandi was not recognized as the tourist spot. Maybe it was not explored that time. But, now it is a hot offbeat location in North Bengal. The Eco huts seem as enticing as the place 🙂 Thanks for sharing!